Kyosho electronics with NO MODIFICATION, power switch and chassis wiring must be stock. 170g weight minimum on all cars. 2 5mins staggered start qualifiers and 8mins mains. Re-sort after the first round. Doors open at 10am, and qualifying will start at noon. Kyosho and Atomic have sponsored the event with prizes, I have heard that there is a big package on the way. We want to show the locals how much fun and competitive Mini-Z can be, and help them get some club racing running. They would like to host an event every other month. Last edited by EMU; 2018.07.09 at 09:17 PM. An invitational event bi-monthly is ambitious A good goal to have though. It would be nice to see a continuation of the East Coast Challenge that changes venue every 3-4 Months. The rules are very familiar to our group and I'm sure you'll have several of us attend. I'm going to try to work out a carpool. I am working on that... talking with the owner about future plans and can lead to something big. Will there be Trophies? 1st, 2nd, 3rd in the A,B, C? Is the entry fee per class? What is the entry fee? How many pit spaces do they have? Do we need to bring tables and chairs, extension cords, power strips? I will try to work on a car pool also. I will try to make it. I should be there if all goes well. Not sure what is in the circuit pack??? Will they be stocking them at the track? 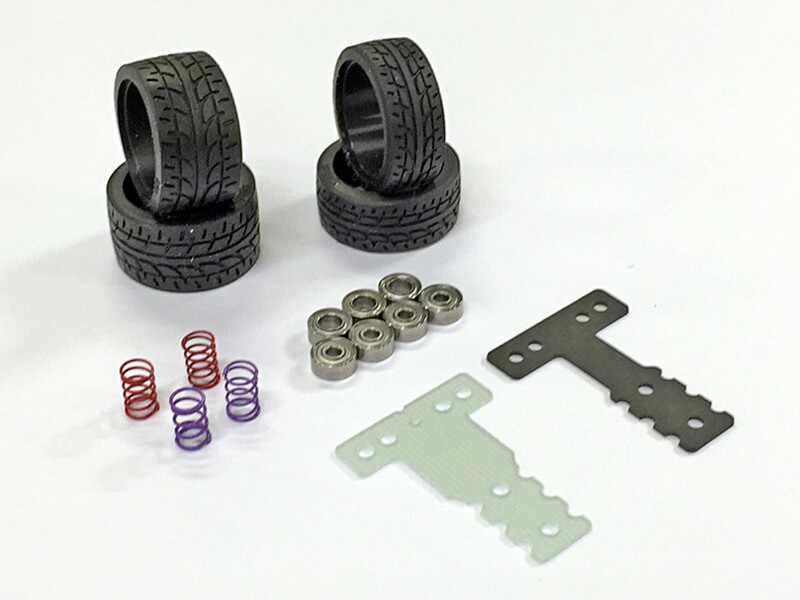 The circuit pack consists of a carbon and frp t-plate, bearings, kyosho tires (30f/20r), and two option front springs (red and purple). It's a kyosho package, first time that I have seen it. They have stock at the track. I personally would prefer to either open the rules ti any kyosho front spring which would then include the circuit pack contents without excluding other springs, or keep the stock front springs only. I don't have a circuit pack, and intend to run my car how I ran it in Maryland. Table and chairs is a good idea if you have it handy. They have space for around 15 in the upstairs pit area. Since Tommy is local to the track , he will contact the owner and fill us in about pit space availability and whether we need extensions and power strips. We will definitelyneed more space than what was available when I was there. I will send him a message to make sure he gets on top of it. The f-book site lists the entry fee as $10 per car, there will be trophies for ABC, 123. Possibly TQ, and hot lap as well. When discussing the class structure, we felt that Remnant had a great base, and didn't want to change the classes too much from what you guys normally run. Gearing is limited in spec classes to either protect the motor in kyosho stock, or protect the sports electronics in 70 comp. I have consulted Grant from PN, and he recommends that the brushless 3500kv motor be geared one tooth higher on pinion than the 70t. Being a big track, where we will ride the rpm limit, we want to try to keep the speed as close as we can. The balance of power may not be perfect going into the first race, not I would prefer to err on the side of caution and not give brushless an advantage out of the gate. Arch, I would love to have an East Coast series... racing in the Carolina Cup series was one of the highlights of my mini-z racing career, despite the fact that I typically had only one or two teammates at the events. We could tally points of the top 5 finishers from each club in each of the classes towards a championship. The owner has a lot of ambition, but no experience with mini-z racing, we are trying to guide him in the right direction as best we can. I have never run an event myself, so this is a new experience for myself, Tommy and Shafiq. I hope you guys can make it, that track is a lot of fun to drive. The circuit pack comes with red and purple springs. These are the only components included in the pack that are not permitted in out local Kyosho Stock Class rules. There has been concern over brushless cars competing in Kyosho Stock. There are availability concerns with the PN 3500 motor, and the cost difference between a brushed box stock car has also raised a debate. Front spring options are now open to any kyosho front spring. Mike, do you know if any of your guys are planning to run a brushless car in Kyosho stock? It may change it to brushed only if there aren't many running. In 70 comp, we have refined the gearing to 70t 4.8, and brushless 3500 ti 4.4. This was done for a couple reasons. It allows people to use the 9/44 gearing on a stock motormount with a 70t brushed motor. The ratios also closely match with 64p and 126p options. So 11/53 for 70t, and 12/53 for brushless would be the maximum ratios permitted. If you have any questions, do not hesitate to reach out and we will address them. I have updated the first post to reflect these changes. Last edited by EMU; 2018.07.29 at 02:55 PM. Congratulations in advance! And good luck to all drivers! Don't forget to post pics! Some of the Remnant guys are working out carpool plans over the next week. Booked this on my calendar, so pics will definitely happen. Skvora, that would be amazing... you are such a good photographer, it will be great to see how your shots come out!!! I have to agree with EMU, it would be amazing. Thanks for putting our GTG on your calendar. Make sure to find me and say hi. Prep for the race is basically done. We have many layout ideas to consider for race day. It will come down to what we have in mind the Friday before race. I like K40 slick fronts with K20 radial rears on the carpet on my 03s. My setup has aggressive steering so some may fair better on K30s.